Within the corporate world, brand guidelines are ubiquitous and tightly enforced. But within academia it seems most people don’t know they exist despite universities generally publishing well-designed brand guidelines. While in my experience, they aren’t generally enforced outside of the corporate branches of the university, it is worth becoming familiar with the brand guidelines of your institution. Today I’m going to walk you through what brand guidelines are and why you should take note of them. So what are brand guidelines? Simply put, they are a set of instructions regarding how the organisation’s brand should be presented. Usually they include detailed rules about what can and can’t be done with the logo, which colours may be used, which fonts, and what type of imagery. They tend to be very strict and can be a real eye-opener to the academic scientist who is not used to thinking along these lines. Brand guidelines may be called ‘style guides’ ‘visual identity guidelines’ or ‘brand toolkits’ but whatever they are called you should be aware of them. Most institutions make theirs available only to staff, others are freely available online, but either way you should certainly be able to access your own and I highly recommend that you do. The great thing about brand guidelines is that, although they may feel prescriptive and limiting, they have been put together by professional designers so by following them you are automatically using best practice design. Here’s a page from the guidelines of Oxford University (you can download these here if you’d like to see the whole document). 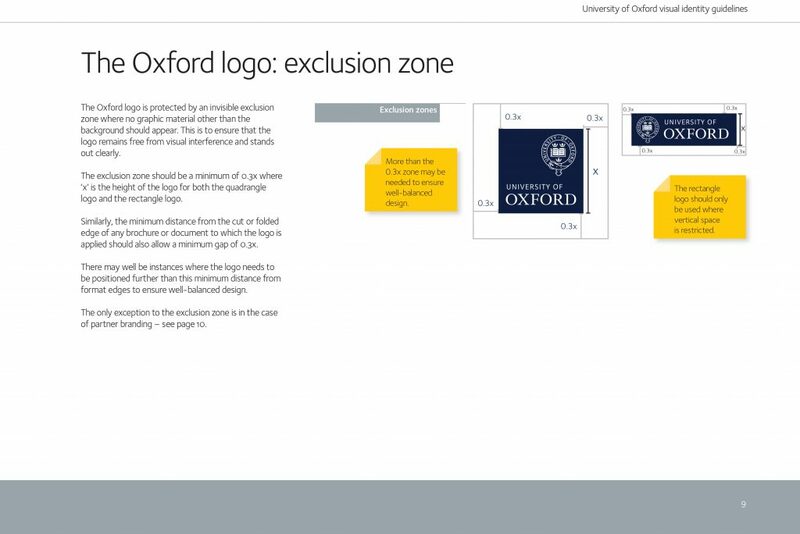 It defines the exclusion zone that must be kept around the university’s logo. On the left, your eye doesn’t see a hexagonal logo on a white background, it sees a square logo with elongated white triangles in the corners. The top and bottom of the blue hexagon are now bumping into the dark blue background and the whole thing looks crowded and cramped. But if you respect the logo’s exclusion zone and fill it with white as on the right, now the logo floats in its own space, the triangles have disappeared and the overall effect is clean and clear. 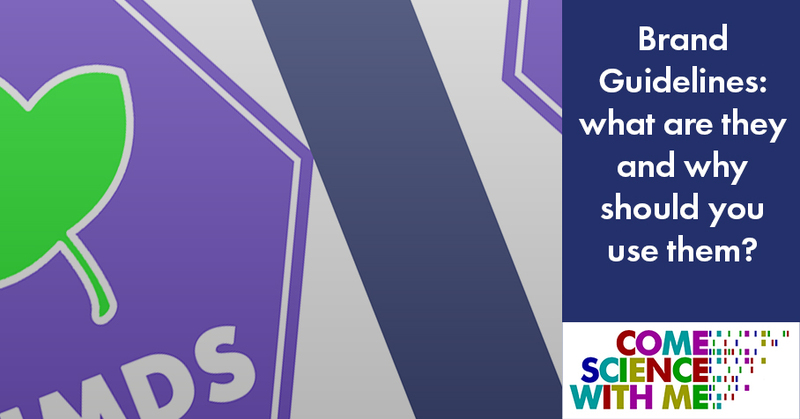 Your institution’s style guide will certainly have guidelines on how to handle the logo on a coloured background. Often they provide a white version for such situations. But if not, then you should always place a logo in a white field as above. If you need to use multiple logos, such as for multiple funding bodies or institutions, then you should make sure they are all of a similar size and that they respect each other’s exclusion zones. And speaking of logos – never, ever, EVER do anything to change a logo. Don’t tilt it, recolour it, add a shadow or an outline. Be very careful not to stretch or squash it when resizing. And don’t scale up a low-resolution version for printing on a poster, it will look terrible. Again, your brand guidelines should detail this – please respect them! This week, go and take a look at your own institution’s brand guidelines. I guarantee you will find things you have never even thought to consider and that will immediately improve your designs.